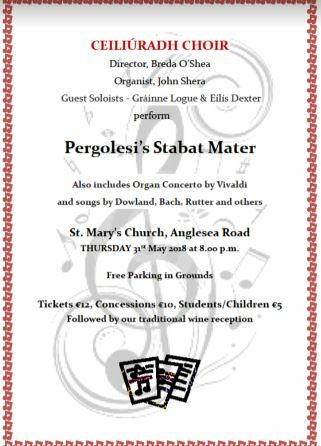 Ceiliúradh Choir, a Sandymount based vocal harmony group is performing a choral version of Stabat Mater, composed by Pergolesi, in St Mary’s Church, Anglesea Road, on Thursday 31 May. Two of our basses, Kieran McAllister and Brian Ingoldsby are joining the group for the performance. This entry was posted in Blog on May 17, 2018 by DCC Admin.